Create a new image file – 600 pixels wide x 450 pixels high is a size that displays well in most email inboxes, and looks good on mobile. 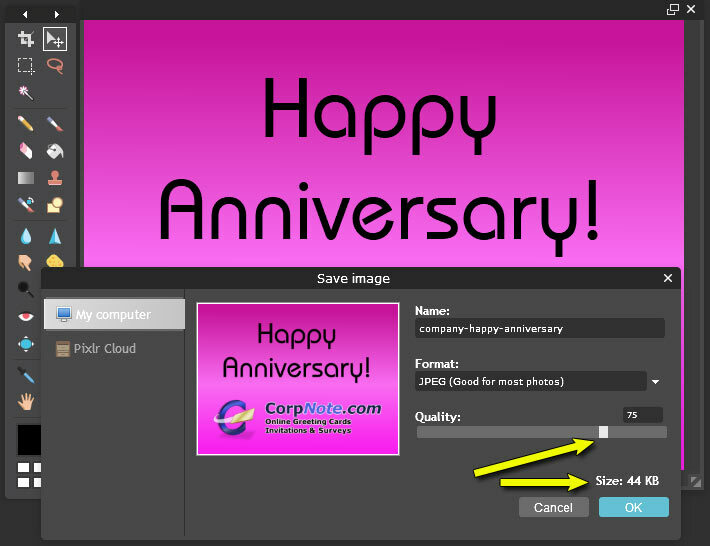 Composite your eCard design – lay out your background image, photos or art elements, your logo and finally your text message. Save your final eCard image so it is email-friendly. Most eCard images can be saved as a JPEG file with medium- to high-quality compression. If your eCard image is 600px by 450px then try to adjust the compression settings so the image file size is <75KB, to make sure it loads fast for people on cellular or slow networks. Insert/Import your image into a blank email so it displays when someone opens it. (Don't send your image as an attachment.) Make sure you use a good subject line and that your card also contains text above or below the image, or your eCard might get blocked as SPAM. *As an alternative to sending your eCard design in an email, you can upload your image and send it using an eCard sending service (like CorpNote). Why make your own eCards? eCards (a.k.a. online greetings cards) are an easy, affordable way to keep in touch. You might be someone that likes to make things yourself just to be different, an aspiring artist that loves the opportunity to showcase their work or an established business that wants a more personalized way to communicate with customers and coworkers. Sending eCards on occasions like birthdays, work and wedding anniversaries, thank-you notes and holidays is a great way to stand out and make people smile... on a shoestring budget! While there are lots of free and pay-for eCard services that offer card designs, many people want to design and send eCards themselves. 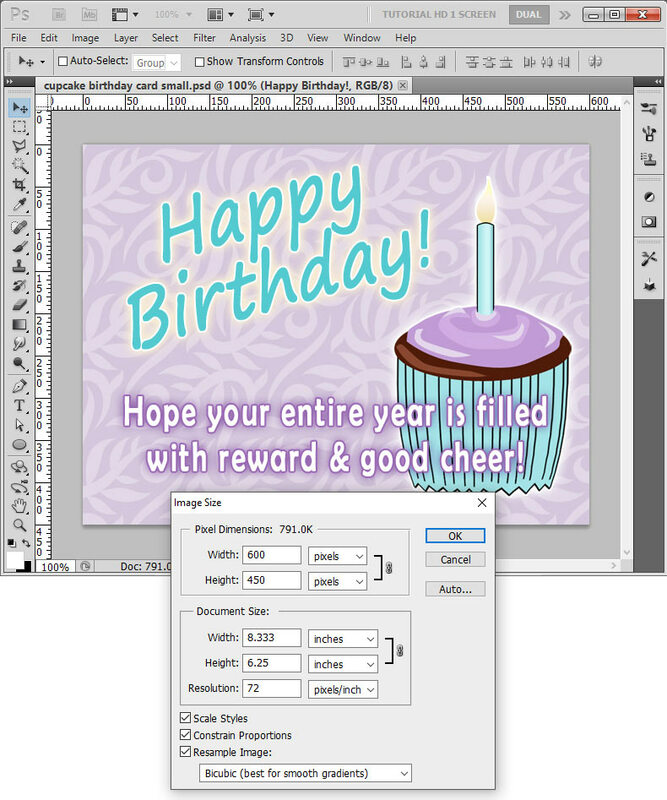 Your image size and how you compose and send your eCard can directly impact whether your eCards make it to your intended recipients, and will ensure that they can view the card easily, and as you designed it. How big should I make my eCard? Email screens are narrow. While it's possible to stretch an email to make it bigger on a desktop computer, most email is viewed in a more narrow window. This is especially true of people who are viewing email on their phone. People reading their email remotely, via a cellular connection or slow Wi-Fi network, will have delays downloading an image if it is too big. This applies to the image size in pixel s as well as the file size as measured in bytes or KB. In addition to making your image a reasonable height and width, you should use image compression to make sure the file size is as low as you can make it without sacrificing too much image quality. With a 600 x 450 px image, we recommend using image compression (JPG 'quality') to try to bring the file size down below 75KB. 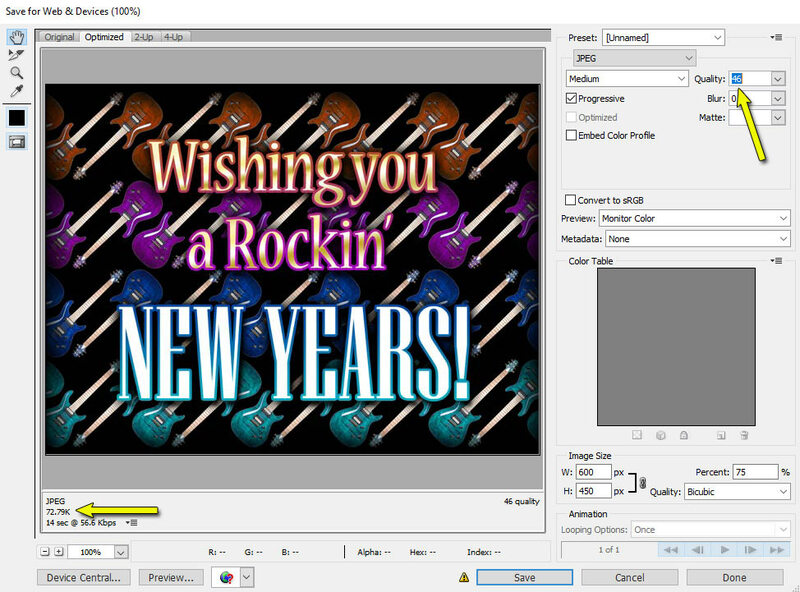 One of the most powerful features of most modern image editing programs is being able to place image elements into layers. Once you've created a file with the right dimensions, layers let you import or paste different art files into your eCard document and move them around until you have the perfect composition. Before you start laying out your card, you should have a basic idea of what you want it to look like, and what extra files you'll need to make it. Many art programs let you select a background pattern, pick a stock photo or let you upload your own picture to use as the background. If you are using your own art or photos, you'll need a file that's at least as big as the card size so you don't have to stretch it. If you will be using additional artwork or a logo on top of your background, and the art is not a rectangle, then try to use image elements that have transparency. Transparency is basically a cutout around the picture part of your file that lets you place the art on top of other elements while 'seeing through' the parts of the image with no art. This can be as simple as a circle that masks a round logo or as complex as a silhouette around an image of a person. File types that support transparency can be .PNG files (preferred), GIF files (lower resolution than PNG) and various types of vector images like .AI (Adobe Illustrator) and .EPS. As mentioned above in "How big should I make my eCard? ", you will need to save your eCard at its final dimensions (in our examples 600 x 450 px) and make sure that you compress your image so the file size is not too big. Compression quality is always a tradeoff. The better the image looks, the more disk space the image uses. As you use compression to make the file size smaller, you give up quality. Most images used on websites and in email (and almost all other digital media) are compressed, and we don't notice the difference. Many image editing programs give you a choice of how much compression to use when you save your image. Some, like Photoshop, give you a real-time preview, so you can adjust the image size down until it's the perfect compromise of quality and file size. There's no hard rule as to what file size your image should be, but you want it to load fast and look good - so try a few different settings until you come up with the smallest file that looks the best. The "Save for Web" export screen in Adobe Photoshop. 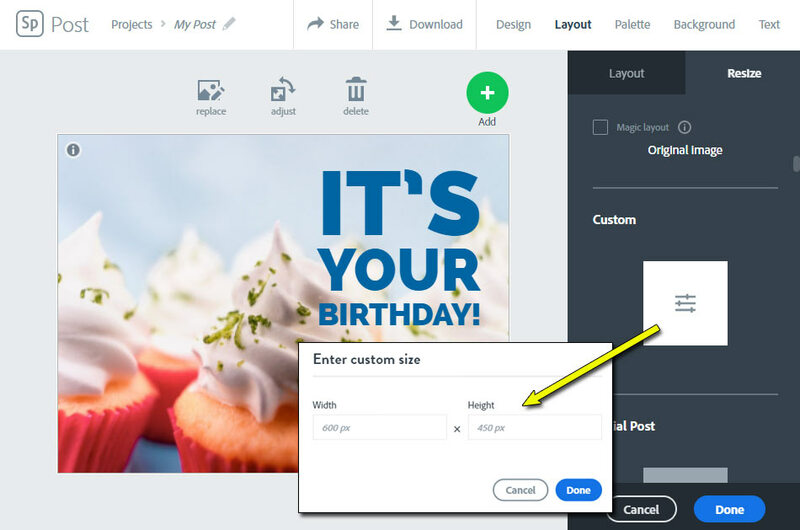 The easiest way to send an image that you've designed as an eCard is to insert or import your image directly into a new email so it displays in the body of the email when someone opens it. But just embedding the image is not going to make the best impression, and – even worse – it may negatively affect how your eCards are delivered and viewed. If you are going to send an eCard via regular email, here are some additional tips that will improve your deliverability and view rate. It's really important that your final email also contains text above or below the image, or else your eCard might get blocked... emails that only contain images are often deleted as SPAM, or filtered into recipient's 'junk' folders. Consider personalizing the top of your card with an intro, like "Dear Sally". Below the image, we recommend that you include a message (using regular typed text) because many people have "display images" turned off when they view their email. At minimum you should include your name and contact info at the bottom of your eCard. If you are a US business, then you are required to include your 'valid physical postal address' and give people a way to opt out of your mailing list, according to FTC business guidelines. Read more about the FTC's CAN-SPAM Act compliance. Not using a subject line will most likely put you right into someone's junk folder. Using a subject line that sounds 'spammy' will either get you blocked, or you will be ignored by the recipient. Also, avoid the overuse of punctuation, like triple exclamations (!!!). It's a delicate balance to be direct in your subject line, while still being unique or creative. We recommend that you be straightforward... say why you're sending the email and identify who you are. 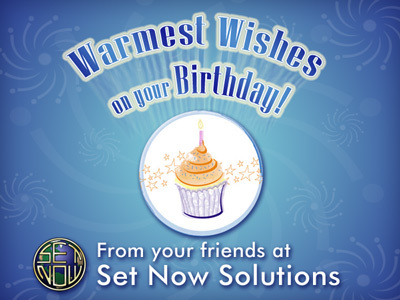 Example: "Birthday Wishes from Mike at CorpNote"
Related: CorpNote FAQ – My eCards are going into SPAM. What can I do to reduce this? Cards sent to individuals for unique occasions – examples of this are when you send an eCard to a person on their birthday, or sending a thank-you note to someone after receiving a gift or entering into a sales contract. Cards that get sent to lots of people, all at once – this could be sending end-of-year holiday eCards to all of your friends, coworkers or clients, emailing an event invitation or 'save the date' notice, or sending a large group of contacts a special announcement like a moving notice, business announcement or other hot info that you want everyone to know. Sending to an individual via regular email is straightforward. Compose your eCard, address it to the person, hit send and you're done! To reach multiple people with a single email, you'll need to add all the addresses to the To, CC (copy or carbon-copy) and BCC (blind carbon-copy) fields. In Outlook, the combined limit of all recipients cannot exceed 100 email addresses per message, so if your list is larger, you'll need to send multiple emails. One of the concerns over sending email to multiple people using the To or CC fields is that everyone's email address in that list is visible to each recipient. Using the BCC field hides this info, but all emails that have a large list of addressees are more vulnerable to being stopped by SPAM filters, especially if you are emailing a group of people within the same company, and you don't work there. Another concern with large email lists is that most email – as it travels through the world's multiple mail servers on its way to your intended recipients – is insecure. There are evil-doers who monitor web traffic looking for large email distribution lists, and attempt to scrape that data to add to their list of valid email addresses that they can sell to spammers. As a general rule, unless you know your email is being securely sent and received, always assume that someone else can see it. Some internet providers and services offer what's called a 'Listserv'. This software can integrate with your email and allows you to manage email lists. Once you are configured and your email list is set up, you can send an eCard as a single email, and the Listserv duplicates the message, sending each person on the list their own copy. Another option is to use an online eCard delivery service (like CorpNote) to compose your ecard, manage your recipient lists and to send your messages. Some advantages we offer are the ability to easily manage many different groups of recipients, view statistics on who picks up your eCard and to schedule when your eCards are sent – including automatically sending eCard campaigns on a recurring basis.